The concept is quite simple. If you imagine your skin as a sponge, it is easier to grasp the concept. A dry sponge does not absorb much liquid. Its surprising, but its true. Try it and see if you don’t believe me 🙂 However, a damp (not wet) sponge will absorb and retain liquids better. So applying this concept to your skin, dry skin will absorb skincare, but it takes longer while damp skin will absorb much more quickly. If you use face oils or heavier creams, you will notice the benefit more obviously. Damp skin however does not mean wet. 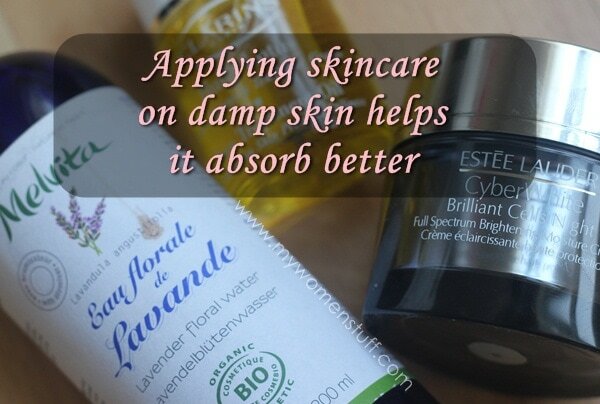 So, its not like you splash water on your face, and while sopping wet, slap on skincare. Damp skin would mean skin that is still moist but not fully dry. If you’re anything like me, this is almost impossible for me to achieve because I do not keep my skincare in the bathroom. After washing my face, I usually pat dry with a towel, then head to my dresser to apply my skincare. So how do I achieve this damp skin effect? When I use a lotion (toner) I use it over the face mist too. I keep the whole toning and misting concept separate because to me they perform different functions. I do find that lotions (moisturising toners not clarifying ones) absorb more quickly and I personally believe the products work better this way too and deliver better benefits to my skin. You can read more about facial mists – how to use them and the various ones I’ve used over the years. Also, if you use a hydration serum or a hyaluronic acid serum or hyaluronic acid based serum, here is a technique you must consider which is related to damp skin. When applying products to skin, you must try this which is likely the best technique to apply skincare products. I find that you also use less of the product you put on after spritzing, so it lasts longer, so you’re actually saving money as well. Excellent tip.